you have to only follow these steps to add contact form. 2. From the tabs menu click on More Gadgets. Thats it. Now whenever a visitor wants to contact you he can do the same by just press a single button moreover you can see the messages in your email box. Now there would be no need of 123forms and Foxyforms. This contact form is in its initial stage and we may see further development on it. I think you found this post useful , if it is then please keep looking in our website www.bloggingtrainings.blogspot.com. I am going to share Horizontal Navigatin Menus for blogger with css and html codes for free. 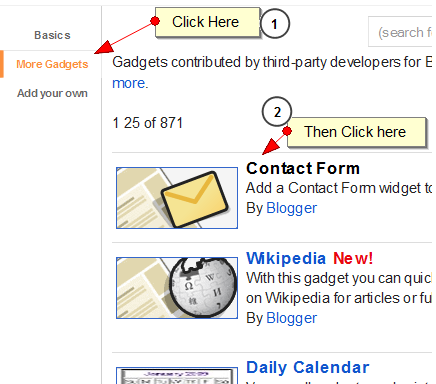 Navigation menu or tab menu is the heart of every web page or blog. It provides the path way to all important pages of the website. To create a Navigation menu you must have good knowledge of CSS and HTML. But since more and more designers are sharing their tutorials online, coding has become far easier. I have brought to you a total of 30 High class navigation menus along with their CSS and HTML Codes from across the web. You just need to copy and paste the codes and that’s it! The Horizontal Navigation Menus below are mostly created by Christopher and Highdots and some by me. I have modified most of the codes in order to make them work in blogger and have also made them pretty easy to be understood by most of you. Further all images are uploaded in my Picasa web album so no effort required on your side. 7. Finally view your blog to see something hanging below your Blog Header/Logo. To change the links, Edit this part of the HTML in all codes below. As a designer I always look for inspiration that can be useful for both my readers and for my designing projects. I hope the resource below will be of great use to Bloggers from all platforms and to designers. Start choosing your favorite Navigation Menu and do not hesitate to ask me if you needed help in customizing it. designer always look for inspiration that can be useful for both my readers and for my designing projects. I hope the resource below will be of great use to Bloggers from all platforms and to designers. Start choosing your favorite Navigation Menu and do not hesitate to ask me if you needed help in customizing it. What could be nicer than to welcome visitors to their blog with falling snow.It's time to play with the snow falling and celebrate the occasion with family and friends.If you own a Blogspot blog, why not give the effect of snow falling there to celebrate this occasion with your visitors and readers.How about falling snow in your Blog ? I have been working hard at creating some cool Christmas effects for your blogs.Its much simple than any other trick found on the net because you just have to add a simple single code to your blogger blogspot blog. You can replace the image with anything you want. You can display falling hearts, falling the autumn leaves, falling New Year message and diamonds, Just play with the code and change the flavors. you like color snow.if I could make the effect of snow with different colors.code that will allow you to add any snow fall color to your blog.To change the color of snow fall only change the highlight color blue in code.You can change basic colors (red, black, green etc) or Html hex colors. var enableinNS6 = 1 //Enable script in NS6/Mozilla? Snow animation could be slow in those browsers. (1=yes, 0=no).